Mug cakes are my secret weapon. When I am too tired or busy to prepare dessert for my family, mug cakes are our go to treat. Each person has their own individual dessert so there is less fighting and easier clean up. Pumpkin spice mug cake is inspired by holiday flavors and is delicious with salted caramel whipped cream. Step 1: In a large mug, combine flour, baking powder, sugar, milk, coconut oil, pumpkin puree, vanilla extract and pumpkin pie spice. Whisk until ingredients are well combined. 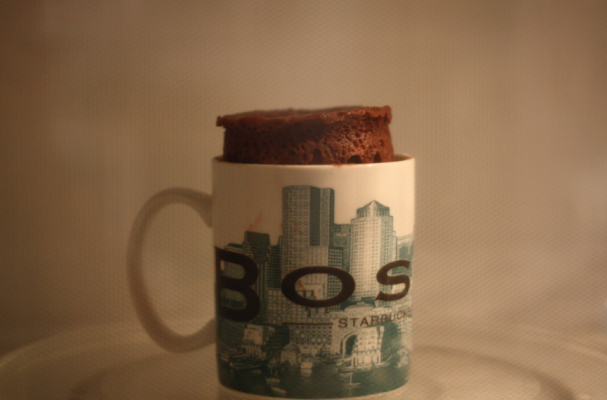 Step 2: Cook mug cake in the microwave for approximately a minute and 10 seconds. Allow to cool slightly before removing. Step 3: Meanwhile, whip heavy cream until stiff peaks form. Fold in the caramel sauce by lifting the sauce from the bottom and cutting it through the top. Top mug cake with whipped cream.